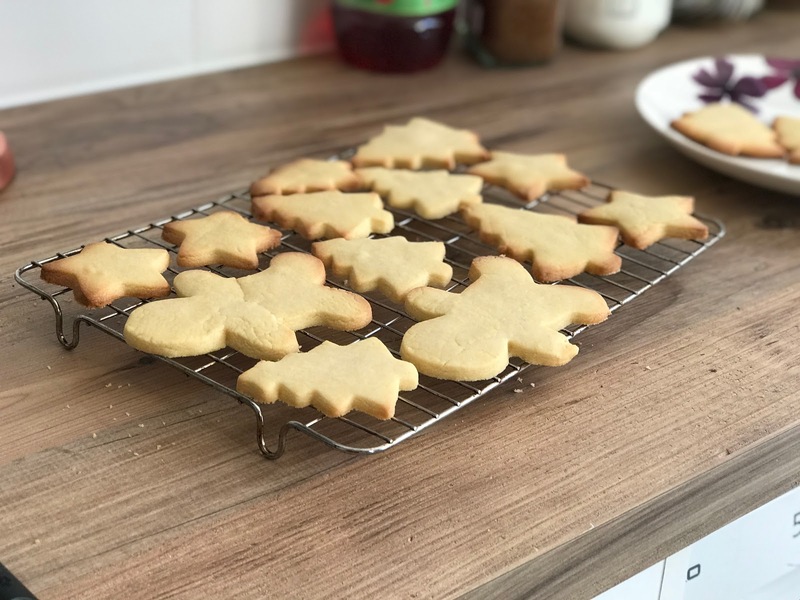 The other week my mum popped round for an afternoon of baking, and we decided to make Christmas cookies. This was something that we also did last year and it was kind of practice run I guess as I don't bake any other time of the year so I had no idea what I was doing other than following instructions, my mum how ever is a little bit of whizz in the kitchen but she had never made Christmas sugar cookies so as you can imagine it didn't quite go as smoothly as we'd have liked. At the time we didn't think that mix was going to make many cookies so we doubled the amount of everything but there was something we'd forgotten to double. ( Iv'e forgotten what it was ) so it just straight up didn't work. We started again as it was clear that that batch wasn't going work, we couldn't roll it or cut shapes and it was just an all round disaster but the second batch actually turned out really good. But because we did double the mix... sooo we were eating cookies for the following month.. I know its what people do at Christmas, but that was serious. amount. of .cookies. But we had such a lovely afternoon baking and chatting and we don't really get much time to have a mother daughter afternoon. 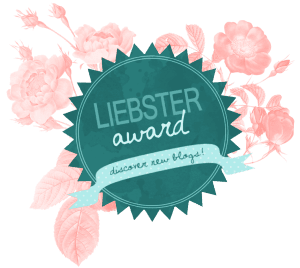 So initially what started out to be something I purely wanted for my blog (I didn't blog about it in the end) ended up being a really lovely day. So I thought it would be nice to do it again, maybe it will become a new tradition for us. who knows. Butter 250g / 1 cup and tad bit more..
cream together until it is all mixed together and smooth consistency, slowly add in the flour keep mixing to ensure no lumps in the mixture. 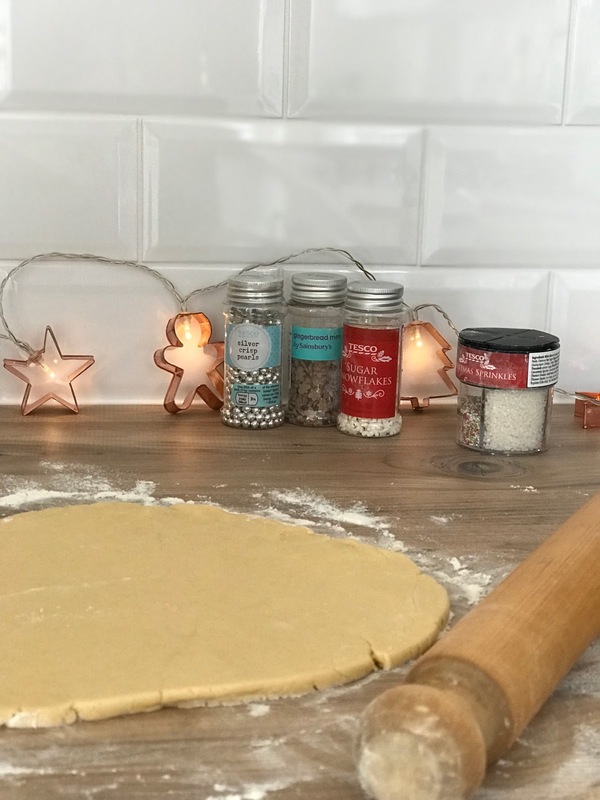 It will get to thick too mix with a spoon when all flour is in so use yours hands, but try to just use your fingers not the palm of your hands as the dough doesn't work as well when its warm. When you have a firm dough, put in a bowl and wrap with cling film and place in the fridge to chill for 30 mins. While thats chilling you can prepare your baking trays, I cant recommend non stick trays enough they are so much easier but not essential, using a little butter rub over trays to stop the cookies from sticking. Roll out you dough, depending on how thick you want your cookies to be we found about half centimetre was about right. we found it easier to break it into 4 and work with smaller amounts. 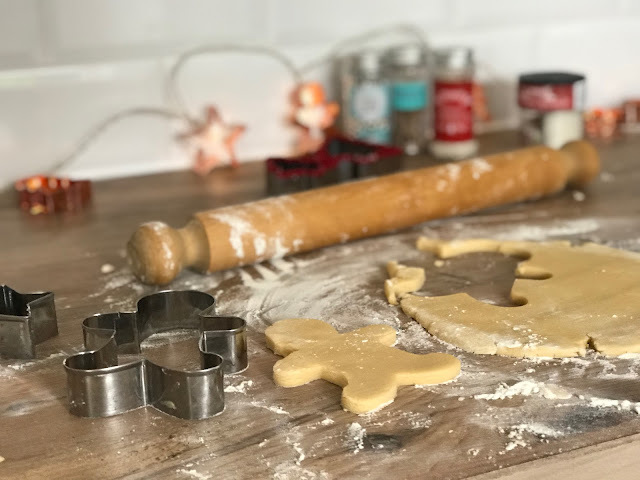 Using you Christmas cookie cutters or any shape you like cut out the dough and place shapes onto your baking trays. Try not to put them too close as they will spread out a little bit in the oven and you don't want them sticking together. Bake for 10-12 mins until a light golden brown. Place on a cooling rack to cool. 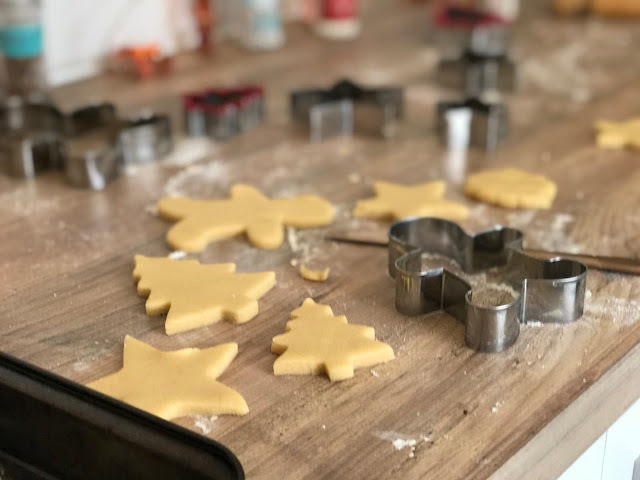 While they are cooling you can prepare your icing to decorate your cookies, add your icing sugar into a bowl with the egg white and mix, this is where you have to make a judgement to how much cold water you need. 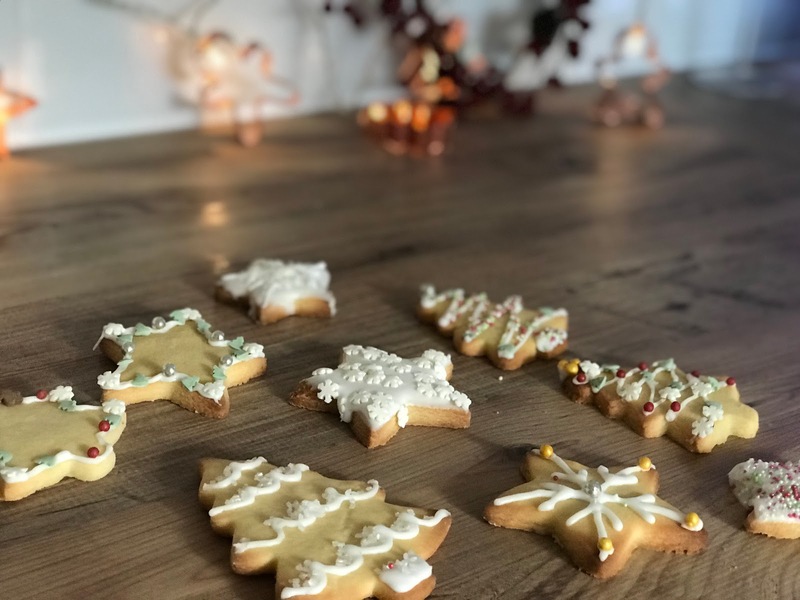 You'll need the icing sugar runny enough to spread but thick enough to stay on the cookies, you can always add more water after if you think the icing is too thick. 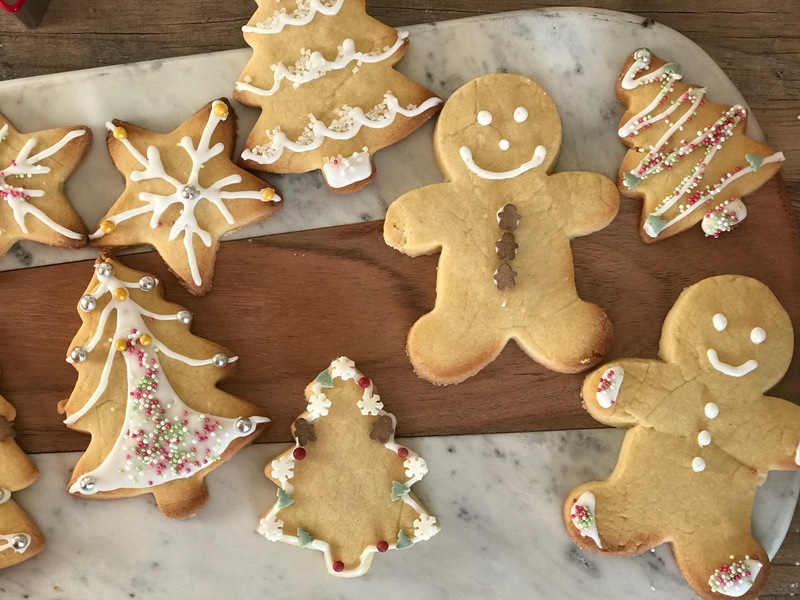 Once the cookies are cool you can ice them how ever you like, you can add food colouring to the icing to give them a little more colour and look a bit more festive. We didn't have any at the time and we just used sprinkles. I don't think either of us will go on to win master chef any time soon, but we had a lovely mother daughter afternoon and I think thats what Christmas is all about. Getting to spend some quality time with loved ones no matter how often you seen them it is always really important. And we got some really tasty cookies out of it too. I want to try to make these again (by my self) to take with me to my friends house for Christmas, and I would like to personalise them, hopefully they don't read this and their hopes up for delicious cookies for me to screw it and end up going to Tesco..? wish me luck! !